Freaks of Nature, we welcome you to Dillford, where three days ago, everything was peaceful and business as usual: the vampires were at the top of the social order, the zombies were at the bottom, and the humans were getting along in the middle. But this delicate balance was ripped apart when the alien apocalypse arrived in Dillford and put an end to all the harmony. Now it’s humans vs. vampires vs. zombies in all-out, blood-sucking, brain-eating, vamp-staking mortal combat – and all of them are on the run from the aliens. It is up to three teenagers – one human, one vampire, and one zombie – to team up, figure out how to get rid of the interplanetary visitors, and try to restore order to this “normal” little town. The most promising aspect of Freaks of Nature is the cast, which includes a few notable comedians. Keegan Michael Key (Key and Peele), Bob Odenkirk (Better Call Saul), Denis Leary (Ice Age), and Patton Oswalt (Dude Bro Party Massacre 3) are among the top billed cast. 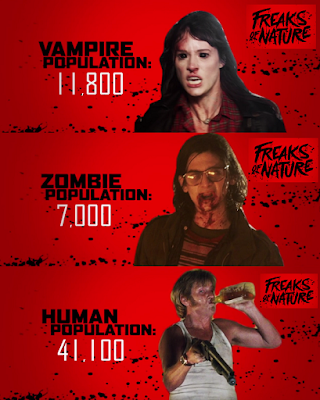 Freaks of Nature is directed by Robbie Pickering, written by Oren Uziel, and produced by Matt Tolmach. It stars Nicholas Braun, Mackenzie Davis and Josh Fadem.